Pro-hunting protestors have disrupted the opening of a long awaited bypass around a Leicestershire village. It is more than 50 years since plans for the two-mile Rearsby bypass were first considered. But on Wednesday around 200 riders and protestors prevented junior Transport Minister Charlotte Atkins from cutting the ribbon. Work on the £7m route began in April this year and was completed three months ahead of schedule. 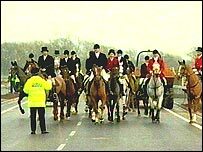 The riders said they did not seek a confrontation but wanted to talk to the minister, who was one of those who blocked a compromise on hunting. Ms Atkins stayed within a contractors compound on the advice, she said, of police. The ribbon was eventually cut by a local councillor. The bypass runs from the roundabout where the A607 meets Rearsby Road in Queniborough to the south of Rearsby village. It is hoped the development will relieve the village of unwanted through-traffic providing a safer, more accessible and more attractive environment for the local community.